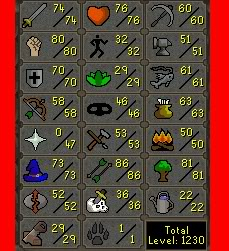 Ill offer 20-30M for a good lvl 98-105 .
ill offer 8mill you go first. With all info then ill give you my cash? I got a lvl 92.
rubio is also trusted in my eyes. he will be a valued member of these forums and hes already a valued friend. lol yea im the very first middle man to put his app on this site ftw? a 98 with 67 def lol? whered u get 67 defence its 73 defnce..
Wat will u pay for my file? but i thought it was a 30 day ban? it was, but im going to go easy on him this time. Life ban if he does it again.